The Citadel of Quebec City is the largest British fortress ever constructed in North America. An active military installation since 1850 the citadel took more than 30 years to build. 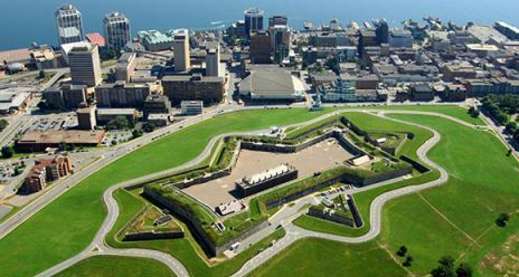 Since 1920 the Francophone contingent of the Regular Canadian Armed Forced —the Royal 22e Régiment— have occupied the citadel. This base now juxtaposes between being an active military compound and a tourist site that even includes tours given by active soldiers of the Royal 22. Learn more about the Canadian armed forces in the onsite museum that includes several notable artifacts, and enjoy riveting views over old Quebec from the citadels highest vantages. Admission to the Citadel runs at around $10 US dollars, entry costs includes a guided tour and access to the military museum. The National Museum of Fine Arts location at the upper most reaches of Battlefields park allows lovers of art to enjoy a great vantage over the Plains of Abraham while soaking in wonderful art. Separated into three different buildings – the Grand Hall, the Charles-Baillairgé Building, and the Gérard-Morisset Building – each building is unique in design and history and provides an additional element to the art inside of them. An example of this is the Charles-Baillairgé Building which once was the Quebec City prison; it is still possible to tour some of the old cells while others have been converted into specific viewing rooms. The only new building of the three is the neoclassical Gérard-Morisset Building. Though the collection of art inside of the art museums confines does not reach the heights of the Lourve or the Met, it still is a well worth checking out as it shows a taste of the iconic French Canadian style. As well many guests also feel like it is worth the price of admission just to enter the previously mentioned buildings. The museum is open from 10 am to 5 pm Tuesday thru to Sunday and is free to view the permanent collection.